A few years before we got married, Hubby and I discovered we both enjoyed camping. A lot. I don’t know why it took us something like seven years of dating to realize it, but it did. Anyway, we started camping and never looked back. It wasn’t long before we started craving more solitude. After all, many campgrounds are anything but serene. There are children chattering, parents calling for them, teenagers being themselves (aka obnoxious), college kids and adults drinking too much and being too loud, family dogs barking, radios blaring and more. That’s when we decided to give backpacking a try. Well, it was a perfect fit, and over the next few years as a married couple, we enjoyed a number of spectacular hikes around the state from spring through fall (never tried winter camping, though we did experience a snowy Easter weekend hike once), including the Pictured Rocks National Lakeshore, Isle Royale National Park, North and South Manitou Islands, the Jordan River Valley, the Fox River Pathway, the Manistee River Trail and more. It was exactly what we were looking for: Peace. Serenity. Being alone with nature. We knew we were going to be taking our kids camping. We wanted them to enjoy the outdoors and feel comfortable there, just as we do. We started out right away, when our first son Logan was five weeks old. We took him to Leelanau State Park. We didn’t actually camp, instead choosing to rent one of the small campground cabins, but he got to enjoy the outdoors at the campfire, dipping his tiny baby feet in Lake Michigan, his first Michigan mosquito bites, and eating at a restaurant with the best view—nursing on top of the Sleeping Bear Sand Dunes. A few months later, we took him tent camping on the Au Sable River, and he did great. Right at home in the outdoors. 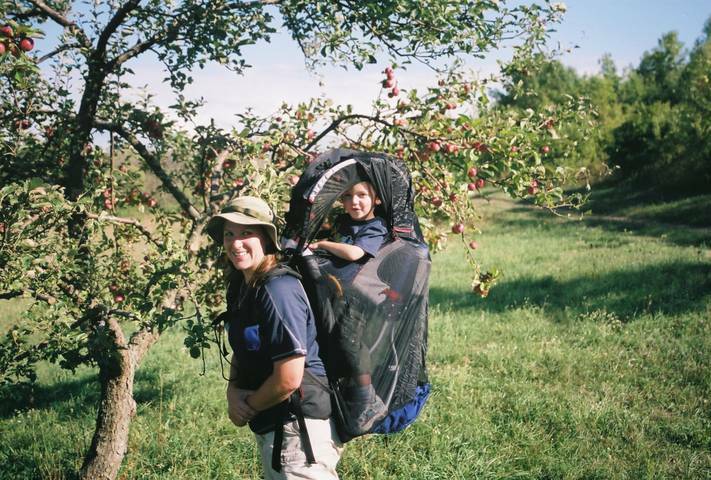 That Christmas, Santa bought the Johns family a Kelty backpack that was made for carrying a child. The following summer, not too long after he turned one, it was time. We scheduled a two-night trip out to South Manitou, and boarded a ferry in Leland’s Fishtown. The boat deposited us on the island and there we were, no turning back. We hiked in a couple miles, set up camp, and explored the island, Hubby and I taking turns carrying the baby. Aside from an extremely windy visit to the perched sand dunes (Poor baby was taking sand to the face at high speed. I would’ve been screaming too!) he did beautifully. Even with a super-long and rough boat ride back to the mainland (The ride took over three hours, when it would’ve normally been about a third of that) the trip was a roaring success. Since then, we’ve taken Logan hiking a number of times, and now that he has a little brother, we’ve ventured out into the wild with both of the boys. 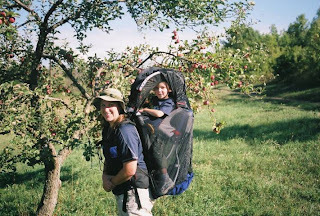 Hiking with kids—especially if one of them is in diapers—can definitely be a challenge, but with careful planning, a good attitude and an open mind, it can be a very fun, enriching experience for the entire family. *Don’t worry too much about taking things to occupy your kids. The Great Outdoors has plenty of playthings. Throw rocks into the lake. Find and follow animal tracks. Build mini log cabins out of twigs you find around camp. Make rock art on the beach. Just be. 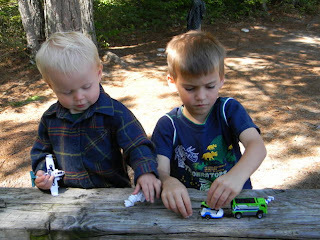 That said, one tiny new toy, like a matchbox car, hidden in Daddy’s pack and brought out when it’s time to set up camp can be very welcome. *Take maybe one favorite book to signal that it’s bedtime. *Don’t forget to offer snacks and water to your kids periodically. A thirsty or hungry kid is a cranky kid. Occasional snacks that aren’t allowed at home (a strategic bag of Skittles is popular with our kids) can go a long way to make a hike fun for kids. *If your child takes naps, try to at least have some quiet camp time in the tent around that time of day. Or, your child might enjoy taking his nap in the backpack as mom and dad explore. *Take insect and sun protection. Little discomforts seem big to the little guys. *Be prepared to pack out nasty diapers. Don’t ever bury them in the wilderness. Take out what you take in. *If your child is old enough, give them little camp chores. “Chipmunk chaser” and “Leave no Trace Enforcer” are some of ours. 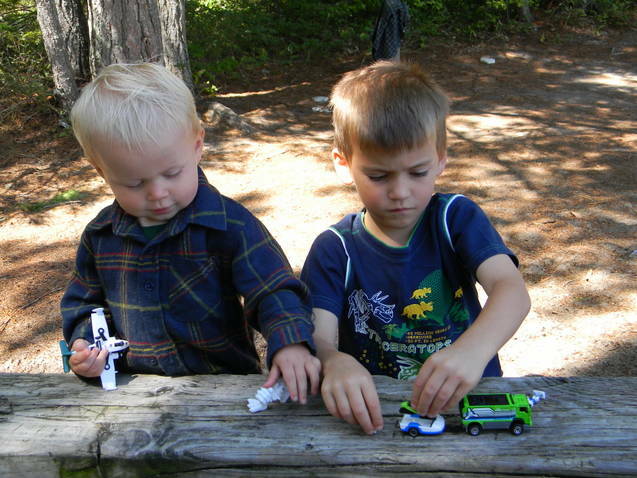 Give the child a Ziploc bag and have them pick up any tidbits of trash they see on the trip. Tell them why they’re doing it. Reward them with a penny for each piece of litter they find, once you get back to civilization. *LET THEM GET DIRTY. It’s a great deal of fun. Who goes hiking to stay clean anyway? *Point out things in the natural world to capture their interest. Bugs, interesting rocks, even animal poop, all can be intriguing to kids. *Think of their likes and dislikes when you plan the trip’s food. That doesn’t tie you to mac n’ cheese or PB&J at every meal, but don’t take something you know they don’t like. For fun, let your child plan one of the trip’s meals. *Above all, keep an open mind, plan well, and TAKE PHOTOS! Oh, and don’t listen to the people that tell you you’re crazy for taking your kids hiking and camping. Feel sorry for them. Let me know what you think? Should I invite Krystal back for more fun posts? The amount of fun you will have on a camping trip with your kids depends on how prepared you are, how flexible you are, and how patient you can be. Having children and toddlers around will entail you to be more organized, prepared, and to pay attention to your child more than yourself. Thanks for sharing!